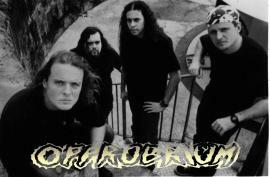 Opprobrium is a death metal band from Metairie, Louisiana. Founded in 1986 by brothers Francis and Moyses Howard under the name Incubus, and reappearing after a 10 year break from the music business in 2000, they were forced to change their name for copyright reasons and in order to avoid confusion with newly emerging Alternative rock band Incubus from California. The Howard brothers had originally emigrated to the USA from Brazil. The band is noted for their particular style, a furious Death/Thrash crossover, combined with Christian lyrics.